The United Nations Signals Academy (UNSA) was established in 2015 as an outcome of the first symposium and as a response to address identified gaps in signals and ICT capabilities of Troop and Police Contributing Countries. Now in its third year of implementation, UNSA is managed by the Office of Information and Communications Technology (OICT) in UN Headquarters, and it is operated at the Regional Service Centre-Entebbe (RSCE) in Uganda. 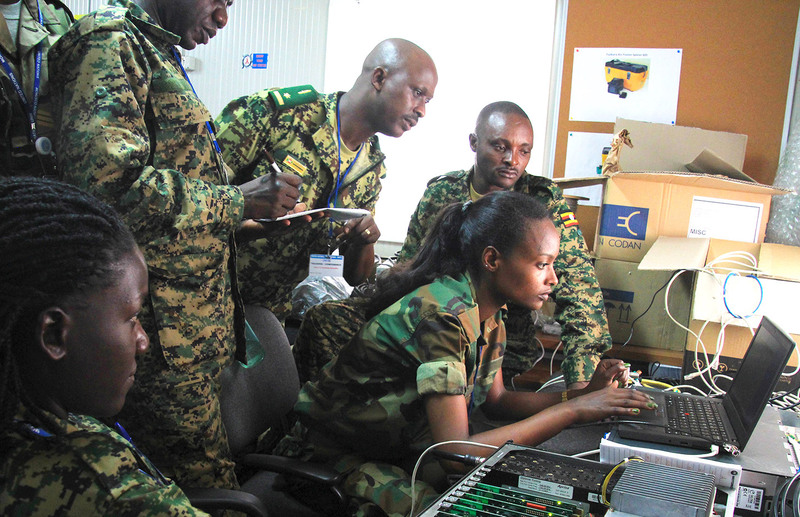 UN Military Signals AcademyOfficers receive hands-on ICT training on UN-owned equipment and UN standard operating procedures. “More complex and sometimes dangerous operations require strengthened communications, situational awareness, interoperability between units and force protection. Yet, “specialized and high performing capabilities for United Nations peacekeeping are in short supply (…)”. Adequate training for military signals and police ICT specialists is therefore essential to ensure that personnel have the prerequisite knowledge and skills essential to provide technological solutions that respond and adapt to missions’ specific operational requirements and evolving mandates. The overall goal of UNSA is to enhance the preparedness of military signals, police ICT specialists and other targeted uniformed personnel prior to their deployment to a UN peacekeeping mission through hands-on ICT training on UN-owned equipment and UN standard operating procedures. UNSA is also committed to support efforts to increase women participation in UN Peacekeeping, in line with SDG5 and SCR2122, which “encourages Troop and Police Contributing Countries to increase the percentage of women military and police in deployments to UN peacekeeping operations”. Training covers on-site training (Pre-Deployment Training, Women’s Outreach Course, Training of Trainers) at RSCE facilities and training in mission. While providing training to bridge current ICT capability gaps, UNSA emerges as a natural hub and capacity enabler for training signals and other uniformed personnel on operating incoming technologies as they are introduced into field operations. The project adopts a triangular partnership model of collaboration between Troop and Police Contributing Countries, the United Nations Secretariat and supporting Member States providing resources in the form of trainers, equipment, funding or other forms of support. The triangular partnership model has been identified by the Report of the High-Level Independent Panel on United Nations Peace Operations as one innovative approach to mobilize specialized and high-performing capabilities.